Many preschoolers are familiar with pumpkins including jack-o-lanterns at Halloween and delicious pies at Thanksgiving. 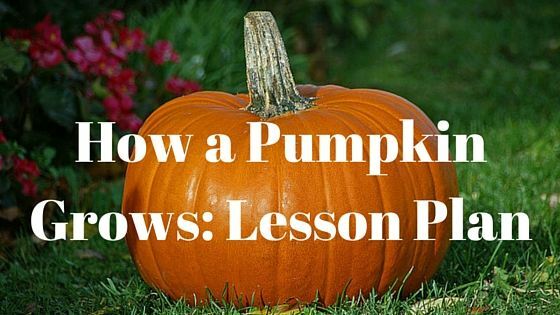 This lesson plan takes a look at how a pumpkin grows, develops and finally decays. This lesson plan introduces preschoolers to the pumpkin plant and how it grows. They will see how a pumpkin plant develops from a seed, how it flowers and produces a large round orange fruit. The objective is to acquaint the children with how vegetables, pumpkins in this case, grow. They will learn about how pumpkins are good to eat. In discussing what they have learned, they will improve their comprehension and speaking skills. Talk to the preschoolers about pumpkins. Ask them if they have seen a pumpkin or eaten it. Ask them to tell you what it looks like. Talk about the types of food that can be made using a pumpkin. Show the preschoolers a real pumpkin and compare it to their earlier observations. Point out the stalk from which the pumpkin is attached to the vine. Tell the children that pumpkins grow on vines. Ask them to imagine what would happen if big ripe pumpkins grew on trees. Hand out pumpkin seeds and either form groups or let each child grow his or her own pumpkin plant. Show the children how to plant and water the seeds in a garden patch if one is available, or in pots filled with garden soil. The children can observe how the pumpkin plant develops from the seeds, produces leaves, flowers, and then pumpkins. They can see how the pumpkin ripens, and if not picked, how it starts to decay. The seeds from its pulp will return to the soil to grow anew. Together with the children, prepare a chart noting the pumpkin growth and its eventual decay as it happens. Along with the practical gardening, or if practical gardening is not possible, show the preschoolers flashcards and/or videos detailing the pumpkin life cycle. Encourage each child to talk about his or her experience in gardening and watching the pumpkins grow. Ask them to tell you what the pumpkin seeds look like, how they are sowed in the soil, how and when the pumpkin plant appears, how it grows, what the pumpkin flower looks like, how the pumpkins look when they first appear and how they change as they grow, how to tell when a pumpkin is ripe and when it is decaying. Distribute drawing sheets and colors, and ask the children to make colored drawings of the pumpkin life cycle. They can also make creative, colored drawings of pumpkins and pumpkin vines. Read out aloud stories and poems featuring pumpkins. Bake and salt pumpkin seeds and offer them to the children to eat. If possible, also serve pumpkin pies. Talk about how pumpkins are carved on Halloween. Show the preschoolers some photographs of carved Halloween pumpkins, or ask them to bring photos of pumpkins their families carved. See a YouTube video about giant pumpkins.